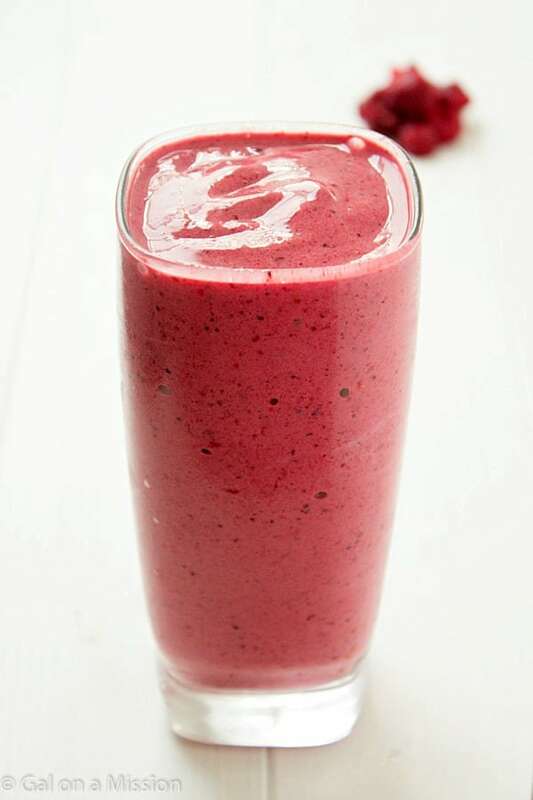 A refreshing and delicious mixed berry smoothie recipe! Perfect for a midnight snack or for breakfast! Lately I have been on a huge smoothie kick; craving all kinds, from green to berry-filled. I just cannot get enough of them! I have so many different versions I have concocted and I am head-over-heels in love with this mixed berry smoothie. 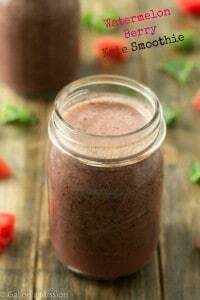 It’s incredible easy to whip up in the morning or whenever I would like to sit down and enjoy a tasty smoothie. 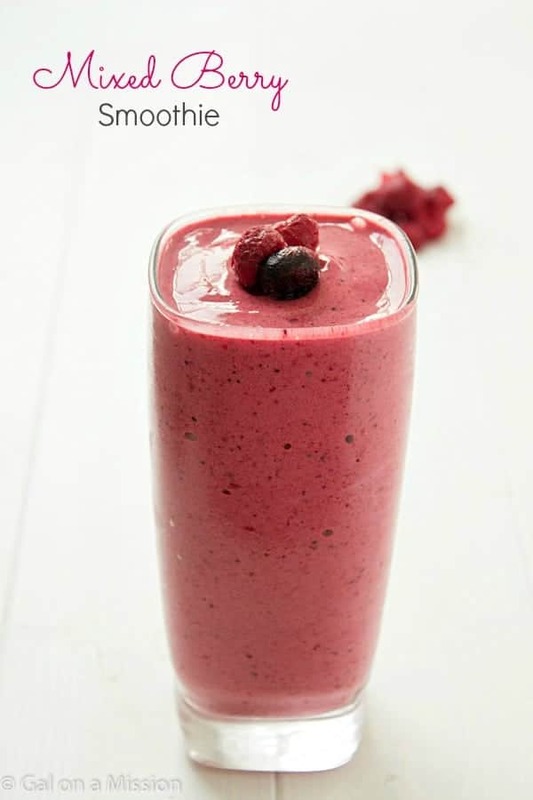 As long as you have a blender, frozen mixed berries, a banana, and a little bit of milk – you are good to go. For my taste it is already naturally sweet enough from the berries and banana, but if you have a sweet tooth and I mean a real sweet tooth, you can sweeten it more by adding a drizzle or two of honey. Mmm…honey! I always get my frozen berries from Trader Joe’s and they are phenomenal. They are the freshest frozen berries and you cannot beat the price. I always make sure we have enough for my late-night snacking or for the best fruit smoothies. Want to add some healthy greens to your smoothie? It’s easy, I like adding fresh spinach or even kale. With kale you will have to remember to not include the stems and only the leaves. Just take a handful of your favorite greens and toss them into the blender. So…easy…so…delicious…and..yummy! I cannot wait for the summer to come and enjoy the watermelon berry kale smoothie! 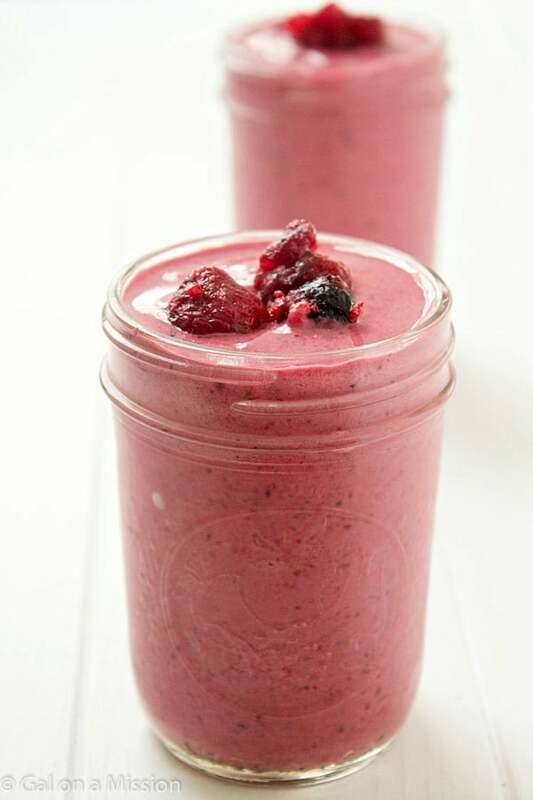 In a blender, add in the milk, frozen raspberries, frozen mixed berries, and diced banana. Blend on high until the mixture is pureed and creamy. Add honey if you need the smoothie to be sweeter. Love the berries on top, makes the whole thing looks so much more appetiting! Thanks for the great recipe. My favourite. Use my own blueberries, ginger, and bananas. Use almond milk for a difference. I loved it! It was so easy! I’ve never made a smoothie, and this turned out amazing! Made my first smoothie today!!! Yeah me!!! The only thing is that I didn’t blend it up enough (I added spinach) so there were some clumps, but wow am i full!!!! Thanks . That would work, Morgan! Enjoy!